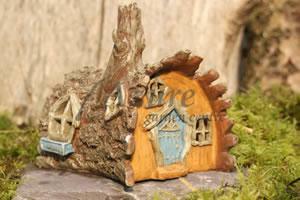 Miniature content daydreaming fairyPerfect to sit on top of a fairy stump.4.9x4.8x7 cm..
From the fiddlehead range.A tree stump hatch with green wooden door.There are natural steps up to the door at the top of the hatch.Hatch opens to reveal a set of glitter covered stepsIdeal for creating a secret entranc..
A set including 1 rooster1 hen 5 chicks.9x2x5 cm..
From the fiddlehead range.A hand painted resin owl that is laughing.4cm high.. 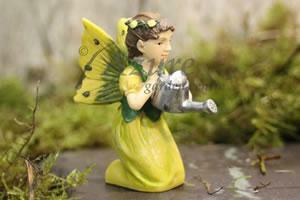 Happy fairy ready to pick the vegetables in the garden.4x7.4x11.7 cm.. 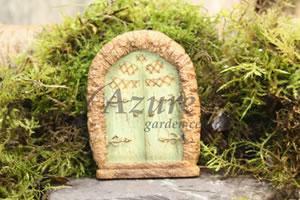 Friendly gnome friend for your fairies.2.85x2.95x5.3 cm..
From the fiddlehead range.A hand painted resin owl that is looking through a magnifying glass.4cm high..
From the fiddlehead range.A hand painted resin owl that is holding a scroll in its mouth that has the words dream on.4cm high..